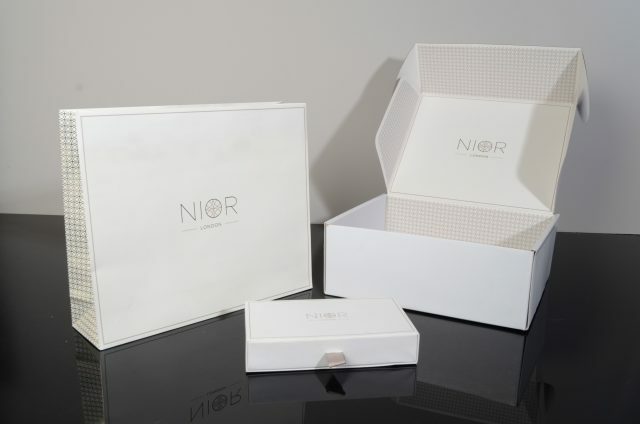 Keenpac has recently completed a project for new British skincare brand, Nior London. From an initial website enquiry, and a loose brief for a presentation box, the Keenpac team worked closely with Anika Patel from Nior London to revitalise the brand’s marketing merchandise. The final set includes a hand printed retail paper bag, mailing box and rigid presentation gift box with sleeve. 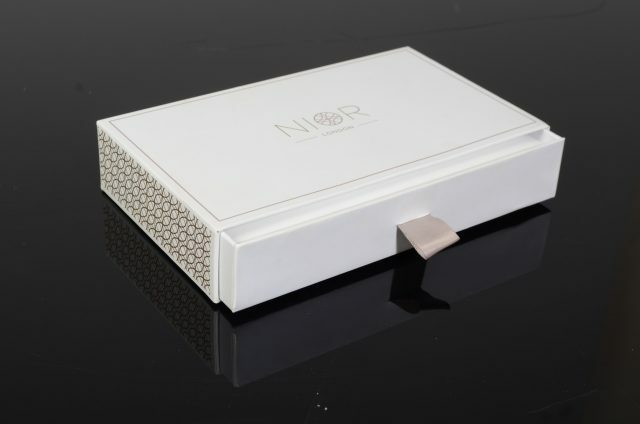 Nior London is the brand-child of beauty entrepreneur Anika Patel. Growing up Anika suffered from a rare skin condition leaving her skin blemished and scarred; with this came a long and tireless effort to find a cream that could help her skin. Leaping from one ‘marvel cream’ to another Anika was only left disappointed that they were not delivering the results she had hoped for. Together with an expert team of chemists and researchers, Anika embarked upon extensive research, product development and testing to create something truly unique – formulas that work. The result is a revolutionary range of clinically tested products bursting with an abundance of active ingredients that deliver results. With a successful collection of products, Anika looked to Keenpac to support her in devising luxurious and impactful luxury packaging to enhance the product values and customer experience. In line with brand guidelines, hot foil technique was used throughout the new packaging. 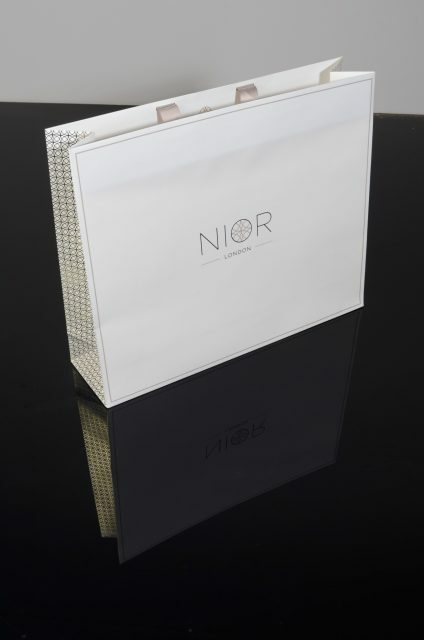 The luxury paper retail bag has the gold foil Nior London logo featured on the front of the bag with replicated branding artwork on both side gussets in gold. The luxury paper bag is completed with double faced satin ribbons dyed to match the gold foil pantone, the bag delivers on elegance and style. The e-commerce box packaging has been manufactured from e-flute/corrugate with white clay coated news and art paper to inner. 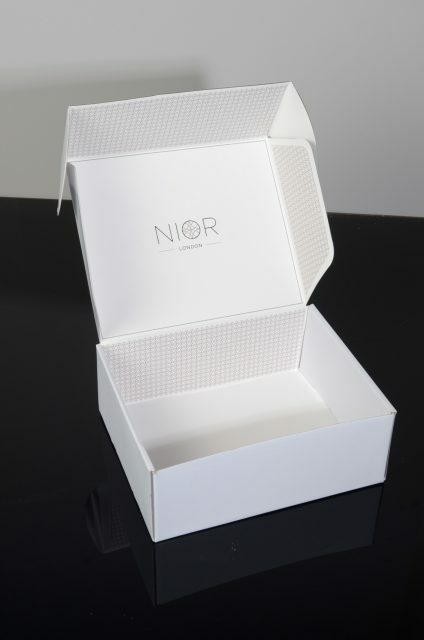 The Nior London branding has been printed 1 line colour on all sides of the inner including flaps, with the outer of the box left unprinted. The rigid presentation gift box includes a drawer box with ribbon tab pull and card insert. The box is completed with a white card insert to hold 5 miniature beauty products.